The RiverWalk is a pedestrian walkway along the MILWAUKEE RIVER in DOWNTOWN Milwaukee. SOCIALIST city planners first envisioned the RiverWalk in the early 20th century, and a segment was built outside the Gimbels Department Store in the late 1920s. In the 1980s, Mayor HENRY MAIER revived the idea and pushed for a connected system of pedestrian walkways along the river. In 1985, the GREATER MILWAUKEE COMMITTEE and the City of Milwaukee rebuilt the Gimbels segment. Other riverfront property owners built their own segments. A completion plan requested by the Wisconsin Department of Natural Resources helped ensure compliance with the public trust doctrine, which mandates public access to waterways. In 1993, Mayor John Norquist’s $9.7 million “RiverWalk Initiative” guided the construction of a walkway from Clybourn Street to Pleasant Street on the west bank of the river and to Highland Avenue on the east bank. The RiverWalk helped attract investors who constructed numerous nearby apartment buildings and restaurants, among other new commercial activity. This success allowed Norquist to expand the RiverWalk into the HISTORIC THIRD WARD and along Commerce Street. Today the RiverWalk has three main segments. 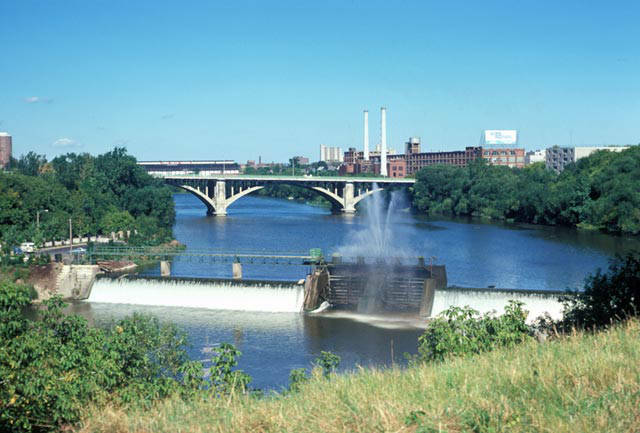 The original segment follows the river downtown. The Historic Third Ward Segment, the southernmost portion, was completed in 2004 and won a design award in 2007. The northern section of the RiverWalk, the Beerline “B” segment, follows a former industrial rail line from North Humboldt Avenue to East Pleasant Street. RiverSplash, a festival centered on the RiverWalk, was held annually between 1989 and 2009. ^ Joseph A. Rodriguez, Bootstrap New Urbanism: Design, Race, and Redevelopment in Milwaukee (Lanham, MD: Lexington Books, 2014), 7, 63. ^ Tom Daykin, “RiverWalk Turns 20 and Is Still Growing,” Milwaukee Journal Sentinel, September 17, 2011, accessed March 14, 2015. ^ City of Milwaukee website, “RiverWalk History,” accessed March 14, 2015; Rodriguez, Bootstrap New Urbanism, 63. ^ City of Milwaukee website, “RiverWalk History,” accessed March 14, 2015. ^ “Milwaukee Riverwalk District Kills RiverSplash,” OnMilwaukee.com, December 22, 2009, accessed March 14, 2015. City of Milwaukee. “RiverWalk History.” Department of City Development. Accessed March 14, 2015.